First up, the Celestron C102, a 4″ f/9.8 achromatic refractor. This is available in a couple of guises. 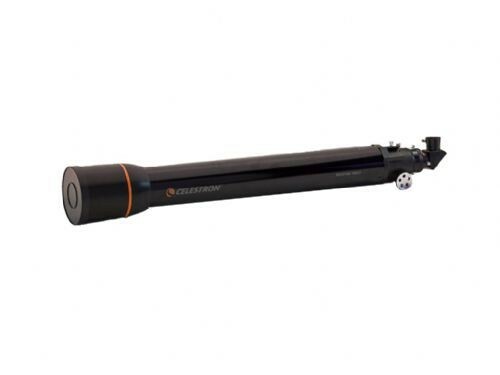 The scope itself, without mount or accessories, can be had from OPT and possibly a few other places for, as of this writing, $119.95. It was even cheaper this summer–at one point, OPT had a package with the tube, a 2″ mirror star diagonal (typically an $80+ item), and some other bits for around $60 $80. * At that point you’re basically getting a solid deal on a 2″ diagonal and getting a 4″ scope for free. Did I pounce? No. But only because I am a moron. Now the packages with diagonals and eyepieces are sold out, and only the bare OTAs are left, and even they will probably not be around much longer. From what I hear, these are factory overstock and once they are gone, they’re gone. The C102GT bare scope was $60. Both the 2” and 1.25” package were $80. All were PLUS shipping. The 2” package came with the diagonal (only). The 1.25” package came with diagonal, EPs, and finder (I think I have that correct – Doug bought that one). I think you said you got free shipping [I did–MW], so in reality, you only paid $15-20 more than what Doug and I bought ours for, though you didn’t get a “package”. I don’t think that there is any danger that the C102 is going away entirely, though. 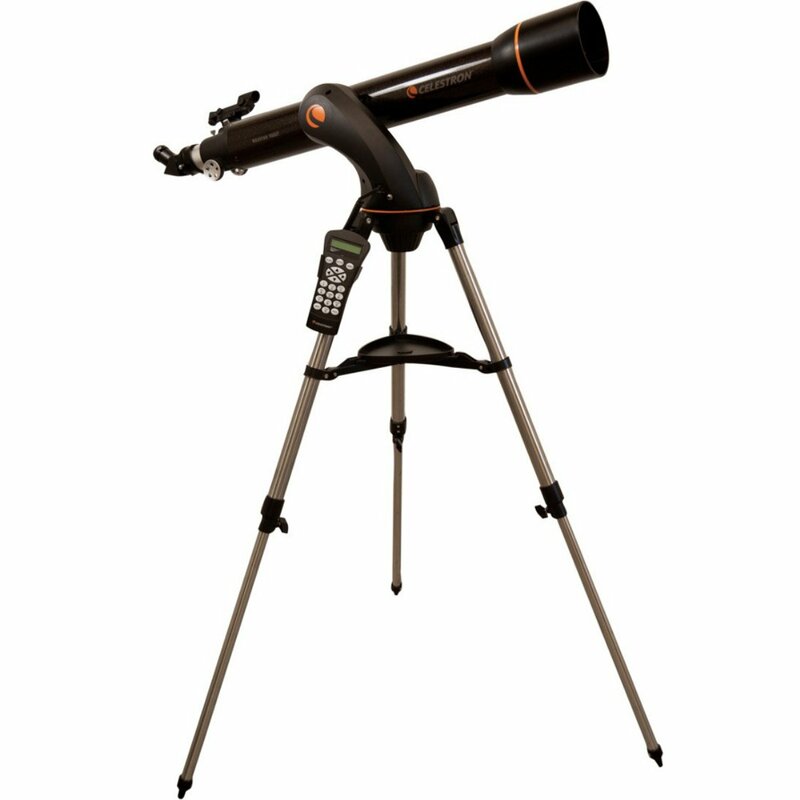 The Nexstar version, with Celestron’s intro-level GoTo handset and motorized mount, is available all over the place. Hayneedle has it for $299. At one point it was selling at Costco for $199, which is staggeringly cheap. That’s where Terry Nakazono got his, which I got to see and look through at the 2012 All-Arizona Star Party. Costco doesn’t seem to have them anymore, or at least they are not listed online, but (a) it might be worth going to your local store to see, and (b) possibly they will be back around Black Friday/Cyber Monday. I stopped by Costco today. The scope this year is a Celestron 90GT. F/l is 910 (box says F/10). It comes on a NexStar mount, likely the same one as last year. The drawback last year was that the NexStar mount was a bit undersized, whereas it should be fine for the 90GT. Price is $179.99. The C102 has gotten positive reviews, even earning a coveted “highly recommended” from Ed Ting. That review is mandatory reading if you are even remotely interested in this scope. I did eventually pounce, springing for the bare OTA version, whose arrival on Tuesday was eerily coincident with the onset of rainy weather. So no first light report yet. But the scope is very big, and seems quite well put-together. I’m anxious for clear, clean skies so I can see what she can do. I note that this is the first telescope model that all four members of what I now think of as the “10MA gang”–David DeLano, Terry Nakazono, Doug Rennie, and myself–have owned. After I’ve clocked some photons with the scope I will write down my own thoughts, and then maybe I will solicit independent reviews from David, Terry, and Doug, and post a giant quadreview (assuming everyone wants in!). Update the Third: I did get my scope out under dark skies–observing report coming soon–and although a full review will have to wait, it is a nice instrument and a solid deal. I recommend it, although for $60 more the 90GT SLT at Costco is worthy of serious consideration. 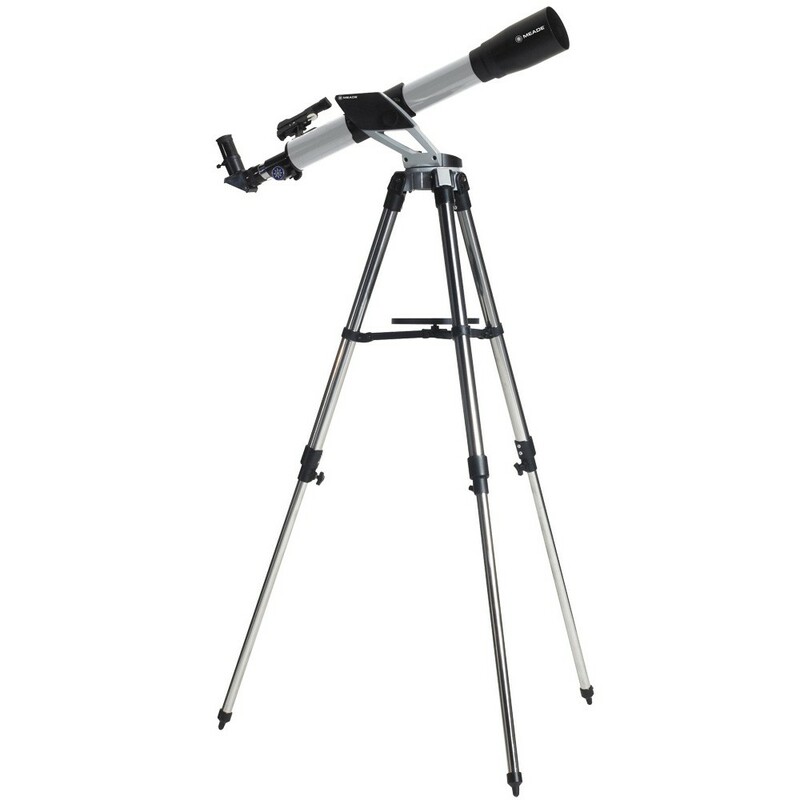 Next item: another achromatic refractor, the Meade NG60-SM, a 60mm f/11.7 scope with tripod, diagonal, eyepieces, and finder, list price about a hundred bucks, currently $24.99 plus shipping. Normally I might hesitate about recommending a “department store” scope like the NG60, but Terry gave it a solid review on CN. Now, if you’re not a 10MA regular, you gotta take that with a grain of salt–not because Terry is a bad observer but precisely because he is such a good one! At this point he’s tracked down 500 or so galaxies, almost all from light-polluted areas, and all using small scopes of 6″ or less (most were observed and sketched with scope of 4″ or less). So he is an expert at squeezing every last ounce of performance out of small scopes, and if you’re not an expert at that (as I am not) you won’t see as much through this scope as Terry does. But you can get there with practice–even Terry was a n00b once–and you’ll see a lot and learn a lot along the way. With all that said, I don’t think that the NG60 would make a terrific first scope for most people; something like the Orion FunScope (76mm, ~$60) or SkyScanner 100 (100mm, ~$110) would definitely gather more light and would probably be easier to use. But I am pretty confident that the NG60 is the best $25 scope currently available, and possibly the best $25 scope ever offered. I am tempted to buy several and stash them in the closet for friends and relatives. To focus on a bright star and find it set in a field of faint ones you never dreamed existed. To see Jupiter as a tiny gray circle with two dim bands across its face; its four pinpoint moons laid out as Galileo saw them. To view the Moon before it was a destination; when it was the great domain of the backyard sky gazer. To strain at the tiny disk of Saturn against a circle of black velvet and for a fleeting instant watch its oval shape resolve into a ring. To behold wonders that the sea of humanity passes by every night without a glance. To stand alone in the dark and weep before the awesome grandeur as the veil of eternity parts in a tiny circle of glass. To live in the sure and certain knowledge that there are things greater than yourself. That’s what a 60mm telescope can show. First off, what Terry said: Great to have you back. I’m looking forward to the resumption of posts and the ongoing conversations on 10MA. I’ve only had my 102 GT out once, really, and that was to observe the moon. The views were scalpel sharp and the resolution almost 3D. And, of course, that great contrast you get with refractors. I intend to take it out the first clear night we have when Jupiter and Saturn are available in my viewing window. I just need to use it more, but with the weather up here the past two weeks, and more on the way, clear observing nights are rare. Though the forecast has sunny and clear from next Monday through Thursday. If so, I will get the 102 geared up to go. As for the Meade 60mm NGC, of course I bought one. $25? I mean, c’mon! It’s a super light little scope and, as Terry pointed out so well in his thorough CN review, the optics are excellent and the slow-motion controls (on a $25 scope and mount???) work surprisingly well. That passage you close this post with is an eloquent paean to what I think could be a worthy little scope. Eager to hear about the results you and London have with yours, both at one of your darker skies sites, and from your driveway/backyard. Good to be seeing bloggin’ happening here! I wish I could say the same… Are you going to SIA Expo? Hope to see you there! Hi Justin, thanks for the kind words. Nice work on scoring that Dynascope. But I gotta say, your 4″ f/12 is even cooler. I don’t think I’ve ever even heard of a reflector in that focal length–I’ll bet that thing is a freakin’ planet killer. Looks like you’ve been busy, but if you get a chance to post an observing report on your long iron, I’d be keen to hear how it performs. Oh–and nice work rolling your own! I probably won’t make it to the expo, but have fun, take plenty of pictures, and tell us about it on your blog!